Harness has 4 pairs of speaker wires, and power wires for Battery, ACC, Ground, Power Antenna/Amp remote, Parking Brake, and 4 pairs of Speaker wires. This list is of known units this harness will work with. MIXTRAX also features Club-Style Illumination that enhances the mood with a dynamic dance club-like lighting effect. Choose among multiple patterns of lighting variations from sound pressure level or low-pass synchronization modes. Boss BV2550UA. This list is of known units this harness will work with. Harness has wires for Battery, ACC, Ground, remote. So be sure to try part to see if fits1st. If you need to know if a harness fits a certain unit not listed. If your system turns on and off when you are driving then most likely you have a bad Power Harness installed in your vehicle. Power/Speaker Harness. This is a Genuine Pioneer Part, it. Orange/White : Illumination. If your system turns on and off when you are driving then most likely you have a bad Power Harness in your system, just replace it with this Original Pioneer Harness. Power/Speaker Harness. This is a Genuine Pioneer Part, it. AVH-X4600BT AVH-X5600BHS AVH-X2700BS AVHX2700BS. Item: Remote for Pioneer. This is the harness that plugs into the back of. New PIONEER 20 Pin Wiring Harness. This harness has 4 pair of speaker wires, Amp/Power antenna remote, Illumination, Acc, Battery and Ground wire. I'll also send a wiring Diagram with harness(see below). Harness has wires for Battery, ACC, Ground, remote. This list is of known units this harness will work with. So be sure to try part to see if fits1st. If you need to know if a harness fits a certain unit not listed. Harness has power wires for Power and Ground. This list is of known units this harness will work with. This is for the 2 pin Version Only. So be sure to try part to see if fits1st. If you need to know if a harness fits a certain unit not listed. THIS IS ONE OLDER HIGH END PIONEER & PREMIER WIRE HARNESS POWER PLUG. be for you buy this plug, be sure to look closely at your radios plug hole and my pictures to see if this plug will fit your radio. This harness has 4 pair of speaker wires, Amp/Power antenna remote, Illumination, Acc, Battery and Ground wire. So be sure to try harness to see if fits1st before hooking it up. this harness. This list is of known units this harness will work with. Harness has 4 pairs of speaker wires, and power wires for Battery, ACC, Ground, Power Antenna/Amp remote. This list is of known units this harness will work with. So be sure to try part to see if fits1st. PIONEER 16 PIN WIRE WIRING HARNESS 4 PIONEER RADIOS (PI 16 002 ) Pioneer 16 pin wire wiring harness for Pioneer car stereos cd mp3 player with the 16 pin plug in the back made in 2002. Comes complete with wiring Color codes printed on the back of the factory sealed package for easy installation. Item Condition: New in sealed packaging Please use the Make Offer Feature to Buy Wholesale Quantities for your store or installs. 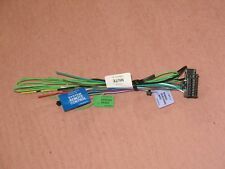 WIRE HARNESS FOR PIONEER AVH-201EX AVH201EX. HIGHEST QUALITY WIRE HARNESS. Give us a chance fix the problem. DO NOT REMOVE SECURITY LABEL, it will void the warranty. We keep records of Serial Numbers for all units we sold. Pioneer Parking Brake Video Bypass. SIMPLE 30-Second FULL COLOR INSTRUCTIONS. THIS IS THE EASIEST BYPASS ON THE MARKET.ALSO Includes HD Video of Install (if requested). This bypass allows you parking brake override function for FULL VIDEO IN MOTION, DIALPAD, AND ALL NAV FEATURES. Harness has wires for Battery, ACC, Ground. This list is of known units this harness will work with. So be sure to try part to see if fits1st. If you need to know if a harness fits a certain unit not listed. Up for sale is a new pioneer sleeve cage can for pioneer den-x7600s and deh-x7600hd DEH-S5000BT DEH-S6000BS models. 2010 PIONEER WIRE HARNESS DEH-2200UB DEH-1300MP FAST FREE USA SHIPPING! 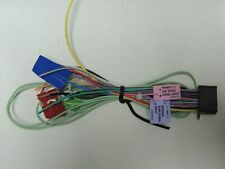 BRAND NEW 16 PIN WIRE HARNESS FOR PIONEER MODELS 2010 AND ABOVE 2010 MODELS DEH-P4200UB DEH-P5200HD DEH-P6200BT DEH-12E DEH-22UB DEH-2200UB DEH-3200UB 2011 MODELS DEH-1300MP. This list is of known units this harness will work with. Harness has wires for Battery, ACC, Ground. So be sure to try part to see if fits1st. If you need to know if a harness fits a certain unit not listed. Up for sale is a new pioneer DEH-X6700BT DEH-6700BS DEH-6800BT DEH-6800BT models cage can sleeve. Should fit other pioneer models. His was a three series BMW. You basically get what you see here there is nothing more. It was working when he pulled it out of the vehicle. Have a Pioneer CD-SB10 Sirius radio interface module and need the power wiring harness?. Inline fuse (1 amp) built right in to the wiring. Fuse can be easily swapped out for a larger one if need be, uses standard auto fuses. It will fit many models which I will list below. IT WILL FIT. THIS PLUG HAS A FEW PART NUMBERS CDE3795, CDP1013, CDE7790, CDE8215, CDE7609, CDO1058, CDE7792, CDE7486, AVH-X7500BT WIRE ASSEMBLY. PLUG STYLE -PIONEER 16-PIN LOCKING MALE PLUG. be for you buy this plug, be sure to look closely at your radios plug hole and my pictures to see if this plug will fit your radio. This is a USED genuine 5Ft USB Extension Cable for Pioneer AVH4000NEX AVH4100NEX AVH4200NEX man fit other models.18670. Use this cable with a P bus pioneer stereo that has the A/UX audio input feature plug this cable in behind the stereo and referred to the section in the instruction manual on selecting the audio input a great peas for playing music from your phone into your stereo. 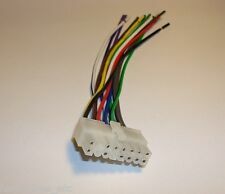 WIRE HARNESS FOR PIONEER AVH-4200NEX AVH4200NEX. HIGHEST QUALITY WIRE HARNESS. Give us a chance fix the problem. DO NOT REMOVE SECURITY LABEL, it will void the warranty. We keep records of Serial Numbers for all units we sold. THIS IS ONE PIONEER 16-PIN WIR E HARNESS POWER PLUG. PIONEER PLUG. PLUG STYLE - 200 2 AND UP PIONEER 16-PIN PLUG. LOOK AT THE BACK OF YOUR RADIO TO SEE IF THIS PLUG WILL FIT. I AM NOT PERFECT I TRY TO GET EVERY ORDER RIGHT BUT MISTAKES DO HAPPEN SO IF YOU GET THE WRONG ITEM. HIGHEST QUALITY WIRE HARNESS. Give us a chance fix the problem. DO NOT REMOVE SECURITY LABEL, it will void the warranty. We keep records of Serial Numbers for all units we sold. WIRE HARNESS FOR PIONEER AVH-X3500BHS AVHX3500BHS. HIGHEST QUALITY WIRE HARNESS. Give us a chance fix the problem. DO NOT REMOVE SECURITY LABEL, it will void the warranty. We keep records of Serial Numbers for all units we sold. WIRE HARNESS FOR PIONEER DEH-S1000UB DEHS1000UB. HIGHEST QUALITY WIRE HARNESS. Give us a chance fix the problem. DO NOT REMOVE SECURITY LABEL, it will void the warranty. We keep records of Serial Numbers for all units we sold.